Sometimes, you hit a home run when you thought you were going to miss the ball. This is one of those times. I knew I was playing with fire. 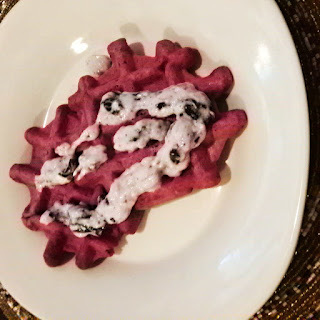 I could find a lot of waffle recipes using beets, but most of them had chocolate added, and I was thinking savory. I actually used 10thKitchen's Beet Bread recipe as a base. At first, I thought I was going to stick with the dill cream cheese too, but once I taste what I had made, I knew blueberry was the way to go. There is nothing savory about these babies. The sweetness of the beet really shines through. These waffles were fluffy, with just enough sweet, and were just amazing. The leftovers are going to be awesome in my toaster. And the colors-there's just so much that could be done! This picture does it no justice. Thanks evening lighting. Poke holes in your beat with a fork. Don't stab it like Dexter on Mr. Potato Head, or you'll learn a hard lesson in how far beet juice flies-trust me, I know. You want enough beets to make about 3/4 a cup chopped. In my case, I'm using the bigger one, and portioning it out as I go. Put the beet, freshly poked, on a plate and microwave 3 minutes over and over again, flipping it each time, until the beet gives a bit to the touch. For smaller beets it will probably be about 6 minutes. My humongobeet took 9. Yes, you can also wrap it in tin foil and bake it at 400 for about 40 minutes, but it's summer, and I'm not baking things. Not even for possible added flavors. Let cool until you can comfortably touch it. Wear gloves, and slice it. Cut each slice into smaller cubes as needed while doing the pureeing. I dice mine small because I use a blender. The gloves are to keep your hands from becoming pink for a day or two. In a blender or food processor, combine beet cubes with a bit of water. Just a bit. Enough to get it moving. Blend. Do this until you have your 1/2 cup of beet puree, not juice. Measure out what you need, and store your beet products for later. The puree freezes well and can be used in many other recipes. Toss your 1/2 cup of beet puree back into that dirty blender, and combine with coconut milk, melted butter, egg, and baking powder. Blend smooth. Add flour about 1/4 a cup a time to the blender. At the end you might have to get out a spoon to finish stirring, but I usually finish it all in the blender. Pulse until all combined and smooth. Heat up that waffle iron. If you have PAM around, spray it down. Alton Brown said it's ok. I don't keep that in the house, so I always wipe it down with a bit of butter or coconut oil. Spoon into middle of waffle grid. Just as much as you normally do. Maybe a tad more. As with any waffle, cook until steam dissipates, and store under towels to keep warm. Combine topping ingredients, and mix well. Serve with topping, or syrups. Sometimes I used just a plain blueberry compote. About 86 calories a waffle. Topping not included.